To Friends of City Lights Artists’ Co-op! 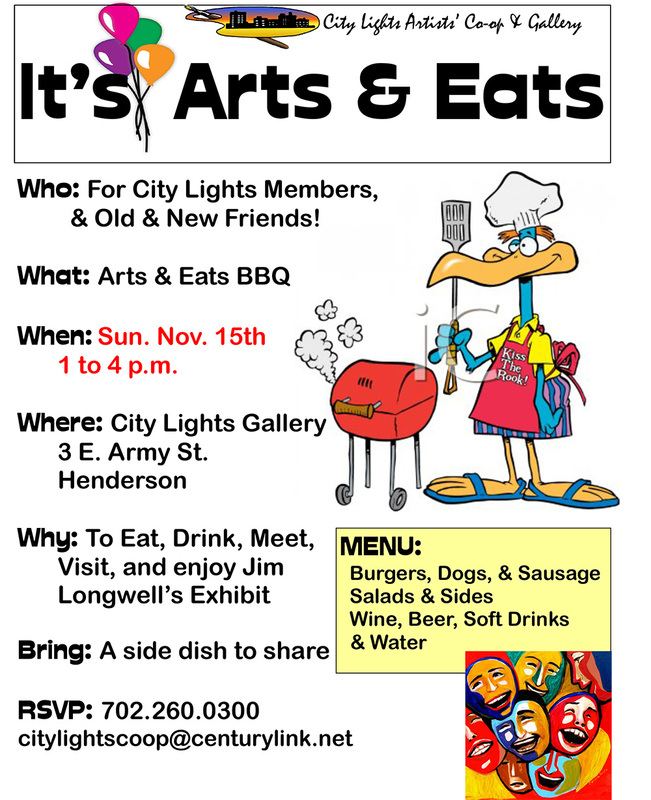 We are stoking up the grill, please plan to join us on Sunday, November 15th at 1pm for food and fun at the gallery located at 3 E Army St.! It’s a PARTY!!!!! ARTS & EATS is an opportunity to visit with co-op artists and meet new friends. The afternoon is a celebration of our recent successes in terms of membership and funding our scholarship goals! It’s purely a ‘kick back and enjoy each others’ company’ social occasion from 1pm until whenever on Sunday, November 15th. November Featured Artist, Jim Longwell, has graciously agreed to share his Featured Artist reception with this event. We’re borrowing a BBQ grill and will have burgers, brats, Kosher dogs and cold drinks on hand! It’s a chance to meet, greet and eat! Bring your family and friends! Bring people who have never had a chance to visit the Gallery or who haven’t seen it in a while! Please circulate the attached flyer to make sure we have lots of guests to enjoy great art and the camaraderie. Three members, Anne Carter, Jim Champlin and Merle Blair have graciously donated pieces for a raffle. Similar to last year, we’re going to ask guests to help us create a piece of art that afternoon that can be used in a future raffle!